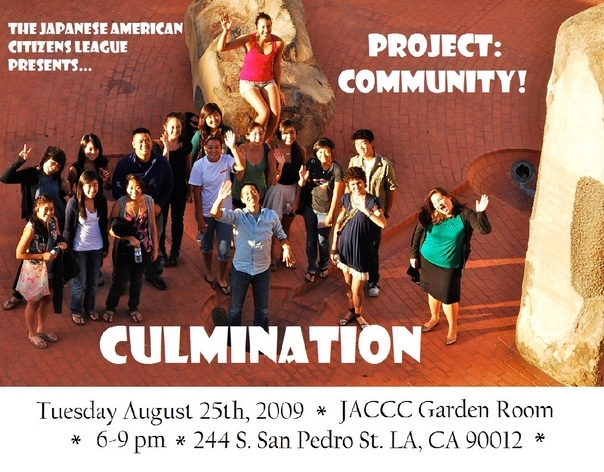 Project Community, a summer youth program put on by JACL PSW, will be having itsCulmination Event Tuesday August 25th. To find out more information about Project Community check you can read the blog post I did a few weeks back here. 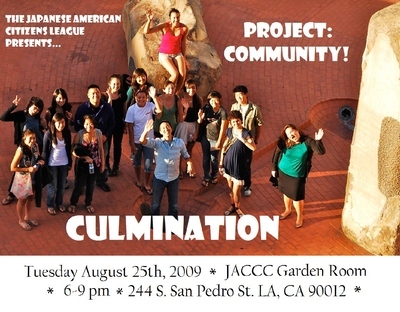 Culmination will take place at the JACCC Garden Room (244 South San Pedro Street, Los Angeles Ca 90012), from 6-9 PM with a business casual dress code. The event is FREE, and the Project Community Participants will be showing off an art piece they have been working on over the course of the summer. Please stop by if you you are able there will be a raffle and a great opportunity to meet the participants.